The Silverstone round of the 2015 Formula Renault 3.5 Series produced only one point for Jazeman Jaafar, with the young Malaysian being hampered by reliability in his fight for the championship title. A tenth place finish in the first race netted Jazeman a single championship point, but a gearbox issue after just three laps of running in the second race left him without drive and marooned out on track, forcing retirement and a DNF on the score sheets. The weekend began and ended with reliability issues for Jazeman Jaafar. In the first practice session he was quickly out on track and third quickest after his first timed lap, but after only two more laps, he lost power and had to pull off track. After the session the car was returned to the garage and the team found an electrical problem which had caused the loss of power. In the second practice session Jazeman was back out on track, but having lost so much running was behind with the set up programme. He put this behind him and worked on developing the performance of the car and was able to translate his hard work into an excellent fourth quickest lap in the first qualifying session. Starting from the second row of the grid Jazeman had a blistering start, moving up to second place, although in the fight for position off the grid, he clipped his nose cone, which harmed the balance of the car. Jazeman persevered and in the early stages was fighting hard with the front runners, but a hit on the rear tyre from a rival during a close battle caused rear suspension damage and this affected the handling of the car. Jazeman could only try to keep pushing on despite suffering severe tyre graining from the damage, but with others around all vying for position, he was unable to challenge and dropped back down the order as the race progressed. He salvaged one championship point when he crossed the line in tenth place. In the second qualifying session Jazeman was not as comfortable with his car as he had been in the first grid-setting session and despite his best efforts he recorded tenth quickest lap. The fast-starting 22-year-old showed his prowess once again when the lights went out, moving up to sixth place by the time he was through the first corner. Hot on the heels of the leading cars, he set about improving his position, but all his efforts were in vain when the car lost power forcing him to pull off track and into retirement, a disappointing finish to the weekend for Jazeman. He said after the weekend, “It’s tough to leave the weekend on such a low point and have reliability issues which really hampered our performance. After suffering with an electrical problem in the first practice I was able to pull it back in qualifying. After probably my best start of the season, I struggled with the car handling after three different racing incidents, but at least I finished in the top ten. 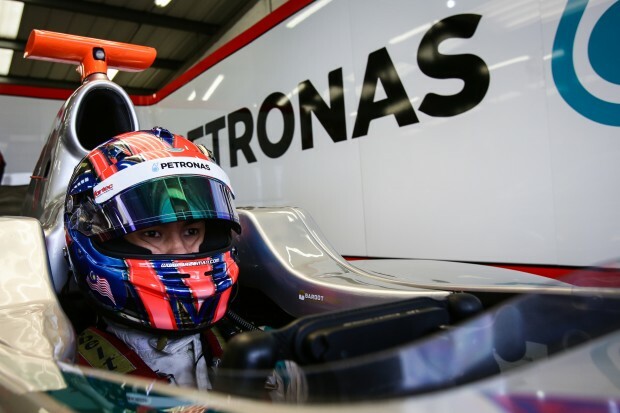 Jazeman has little time to reflect on a challenging Silverstone, as he quickly heads off to Nurburgring for the next round of the championship which takes place next weekend.